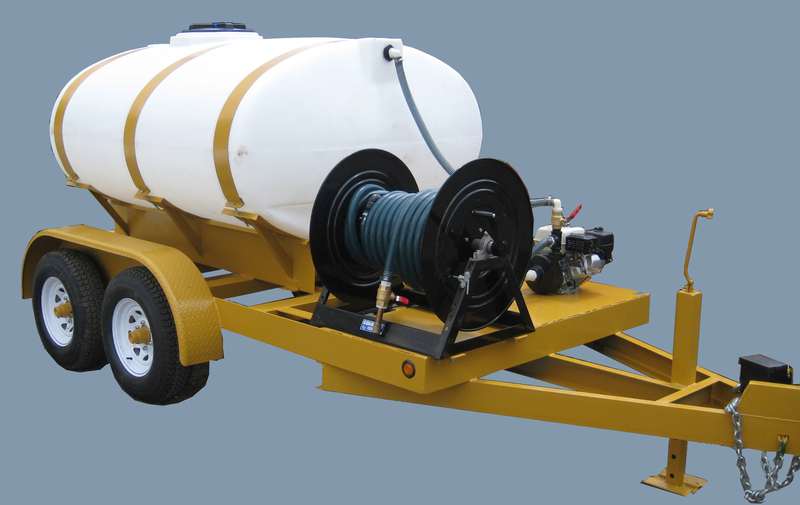 Turbo Turf makes water trailers or pull type watering units in 300, 500, 750 and 1000 Gallon sizes. The 300 gallon size is available in an off road model that can not be used on the roads and all other trailered units are equipped with brakes, DOT compliant lights and brakes on both axles, safety chains and may be pulled on highways. Turbo Turfs water trailers are ideal for construction sites, dust control, watering nursery stock and most any other application where water is needed. Tanks are a low profile oval tanks with a 16 inch fill lid They are powered by a 6.5 H.P. Briggs & Stratton Vanguard recoil start engine (Honda engine optional). They come standard with a 150 GPM pump with a maximum of 35 PSI. The pump has a 2″ inlet and a 2″ outlet. The unit has a bypass and a manual valve to adjust pressure. (Electric in cab controls are optional) These units come standard with 75″ of 3/4″ discharge hose and hose holders on the side of the tank. These units may also be used for watering and dust control applications. Several boom options are available for dust control applications Booms are available that spray up to 30 feet without the booms extending beyond the width of the truck. Booms can be set up with wired in cab controls or wireless controls that eliminate any wires running from the cab to the trailer. *When purchasing the Electric Rewind reel we recommend adding the Honda Electric Start engine package which gives you an electrical system to power the reel. Otherwise to use the reel you would need to connect to your vehicle’s 12 volt electrical system.